Inda returns to Shelter in Place at her favorite hotel in Casper to play at the Ramkota with the acoustic trio featuring B. Rehm-Gerdes & Jeffrey Smith on Thursday, Mar 7 at 5pm. Inda & crew travel to Laramie, Wyoming to Shelter in Place on the Wyoming Sounds stage featured on Wyoming Public Radio with host, Grady Kirkpatrick on Friday, March 9th at 11:15am (MST). Casper ArtCore presents Inda at the Lyric theater on Saturday, Mar 8 at 7:30pm. 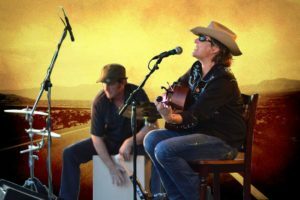 The Authentic Adventures: Acoustic Highway show features Inda's acoustic trio with B. Rehm-Gerdes on guitar & vocals (Phoenix, AZ) with Jeffrey Smith grooving us together with percussion (Milwaukee, WI). Sunday is the new Friday as Inda & crew Shelter in Place at the Backwards Distillery to round out the tour on March 10 at 4pm. Don't miss this off-the-cuff & un filtered performance as we wrap up celebrate the adventure. We look forward to catching up with you!